The 2016 FHA Manual Underwriting Guidelines applies to mortgage loan applications which cannot pass through the Automated Underwriting System and need further research before giving an approval/denial for the loan. An FHA Manual Underwriting means that a mortgage underwriter will manually underwrite the loan and will take closer look at the entire application: credit, credit scores, income, assets, liabilities, and credit history. Mortgage underwriters will be questioning derogatory credit information, public records, debt to income ratios, as well as looking for compensating factors for approval per 2016 FHA Manual Underwriting Guidelines. If you are wondering what compensating factors are, they are positive factors that borrowers have that will work to offset bad credit or negative marks against your approval. Included in these compensating factors are the following: cash reserves, verification of rent, longevity at current employer, income you may have aside from your full-time job, spouse with income who is not on the mortgage application, and any other positive factors the borrower may have. The 2016 FHA Manual Underwriting Guidelines with regards to Chapter 13 bankruptcy is that for the first 2 years after the discharge date of the bankruptcy a manual underwriting is required. Borrowers looking to get a mortgage right after a Chapter 13 discharge don’t have a mandatory waiting period but need to have the manual underwriting. The 2016 FHA Manual Underwriting Guidelines require that a verification of rent be completed for mortgage applications. The proper verification of rent is only valid if the borrower can provide 12 months of cancelled checks to the mortgage underwriter. The borrower also needs to make sure that all rent payments were made in a timely manner to show credit worthiness. The 2016 FHA Manual Underwriting Guidelines also require the landlord to complete a rental form of verification to solidify your story. Basically the 2016 FHA Manual Underwriting Guidelines are looking to make sure the borrower will not have payment shock when they take on the new loan. If the borrower has been making monthly rental payments, they are likely to keep making them towards a house they own. The 2016 FHA Manual Underwriting Guidelines with regards to reserves states that the underwriter is going to want to see at least three months of reserves by the borrower. An example of a one month reserve would be enough money to cover one month’s principal, interest, taxes, insurance, and HOA fees if applicable. 2016 FHA Manual Underwriting Guidelines allows for 100% of down payment funds be gifted to the borrower however, the reserves cannot be gifted. Reserves also don’t need to be liquid cash bank accounts but can include retirement accounts like 401Ks and IRAs. 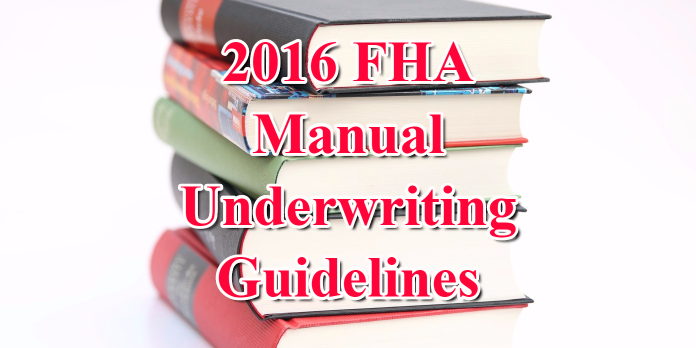 If you aren’t sure how to navigate the waters of the 2016 FHA Manual Underwriting Guidelines, then you need to reach out to me ASAP so we can go over exactly how these rules and guidelines affect you as a borrower. Don’t worry about your bad credit either as we can develop a plan to get you approved and in a new home in no time. Give me a ring 24-7 at 888-900-1020, email at contact@loanconsultants.org, or visit www.loanconsultants.org for more info and loan inquiries.